You'd have to be crazy to fall in love with a clown psychopath, and Harley Quinn is just that. This former psychiatrist was in change of analyzing the Joker while he spent time in Arkham Asylum but instead became utterly infatuated with him. Knowing that she had to be with her main man Mr. J she helped him escape and has done that many, many times for him. But now that part of Gotham City is now a prison and the Joker on his deathbed it is up to Harley to make sure his gang does what they can to take on the dark knight. Now you can look like Miss Quinn from the hit video game in this costume! 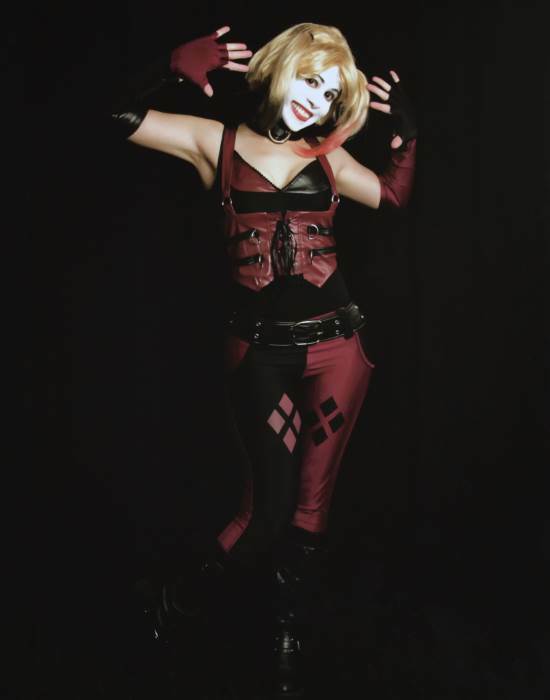 This costume is pretty much as close as you're going to get to Arkham City Harley unless you're looking to go the (more expensive) custom-made route. - It has a snug, accurate fit. - The pieces are made of comfortable materials. - Includes gloves, belt, and dog collar (which are key pieces). - The top and bottom are made of different materials. This isn't really obvious on camera, but it might bother someone who's more detail-oriented. - The collar felt a bit loose (had to add extra velcro to get it to fit all the way around). - The top is a bit roomy. I ordered the XS, and while the pants fit perfectly, I had to readjust the top because it wasn't fitting snugly (could be due to my body shape, but other smaller-busted shoppers should keep this in mind). All around, though, I felt that the costume was a very good value for the cost. Would definitely recommend. Was this review helpful to you?YesNo14 people thought so and 0 didn't. .The outfit fits great but the belt is to small by an inch. No big deal, I have a belt. I am 5'31/2" and weigh 125. Bust 34D waist 27. I love it! Was this review helpful to you?YesNo3 people thought so and 3 didn't. Way too small. Could barely fit the top over my head and then when I did the chest part was seemingly built for that of a child’s and not anyone with breasts. The leggings were alright until you start walking and quickly realize that if you even have a little bum it’s not built for that and starts falling down. It’s also too tight around the waist so even if you don’t have love handles, you do now. They also stop halfway down the leg. The gloves were very foamy and not comfortable at all. I don’t even know if sizing up would help as the design of the clothing is so poor. The collar, belt, gloves (with attached bracelets) and whole top was made of a cheap foam material. Because the gloves were made of the strange foam they were very bulky and not at all fitted like the picture. The bracelets (which are attached) don't even look like they wrap around your wrist when you wear them. The leggings are also very awkwardly cropped and not at all well made.